In fourteen hundred ninety-two Columbus sailed the ocean blue. He had three ships and left from Spain; He sailed through sunshine, wind and rain. He sailed by night; he sailed by day; He used the stars to find his way. A compass also helped him know How to find the way to go. Ninety sailors were on board; Some men worked while others snored. Then the workers went to sleep; And others watched the ocean deep. Day after day they looked for land; They dreamed of trees and rocks and sand. October 12 their dream came true, You never saw a happier crew! “Indians! Indians!” Columbus cried; His heart was filled with joyful pride. But “India” the land was not; It was the Bahamas, and it was hot. The Arakawa natives were very nice; They gave the sailors food and spice. Columbus sailed on to find some gold To bring back home, as he’d been told. He made the trip again and again, Trading gold to bring to Spain. The first American? No, not quite. But Columbus was brave, and he was bright. 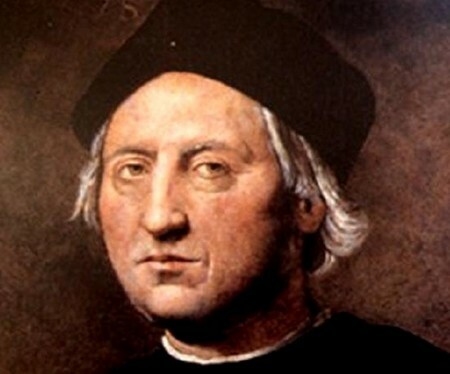 Every year, on Columbus Day, there is a cry of outrage from a segment of our society over the evil Columbus – idiot sailor & murderer – who, it seems, single-handedly destroyed an entire race of peoples. Ludicrous as that may be, some people seem to actually believe it. The white race is the source of all the world’s evils. Well, where should we all go then? Anybody heading back to Europe? Anyway, I was thinking about this yesterday while reading some of the posts I came across. There is a kind of ironic result to all of this. Columbus sailed representing Spain. There is little doubt that the Spaniards, generally, were the most destructive, to the native population, of all the European nations that arrived here. They settled mostly in South & Central America and into Mexico. Today’s Mexicans are mostly products of Spain & the native population. Now, we have 11 – 14 million illegal immigrants within our borders, mostly Mexicans, who are descendants of those very evil Spaniards from Europe. And the left is welcoming them in while our PC politics bend over backward to not offend them. Interesting, is all I’m saying. Hearing the usual “Columbus didn’t discover anything” chatter today. He slaughtered the Indians; he was lost; blah, blah, blah. And it always upsets me. Yet, here we are … How can you deny – or be embarrassed of, at the least – your very existence? Which tribe, I wonder, DID discover America? And which tribes destroyed them when THEY arrived? It’s the story of mankind. Columbus is no more a villain than any of the rest of us. Without him, we wouldn’t be here. Despite claims about the Vikings, hundreds of years earlier, for all intents and purposes, that knowledge was lost to European civilization. Christopher Columbus and Americus Vespucci were my “ancestors” and I am proud of them and that my country was “discovered” and named after them. Happy Columbus Day! Previous Post: “Lost” in the Ozone!